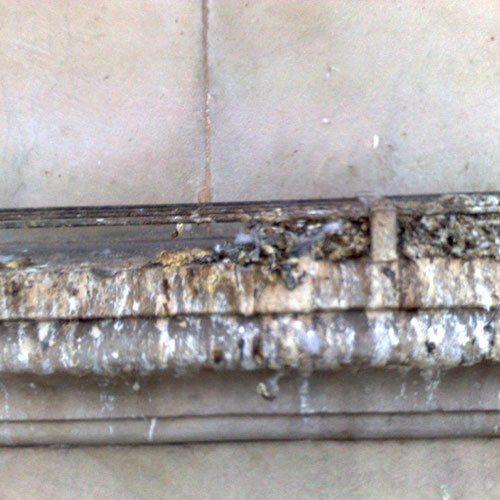 To remove years of pigeon waste build-up from the frontage of the Adelaide GPO, a prominent, heritage-listed building. How would we accomplish this task in one of the most congested locations in the city. The success of this operation relied on thorough and careful planning, following our well-established project management processes. We removed 4,500 litres of waste water, over 2.5 tons of dry pigeon manure and had applied 1,400 lineal metres of bird spikes. Adelaide’s landmark GPO building sits square in the heart of the city’s CBD. How would we accomplish this task in one of the most congested locations in the city, which would involve needing to close-off lanes of major roads and footpaths and moving heavy equipment on and off site? 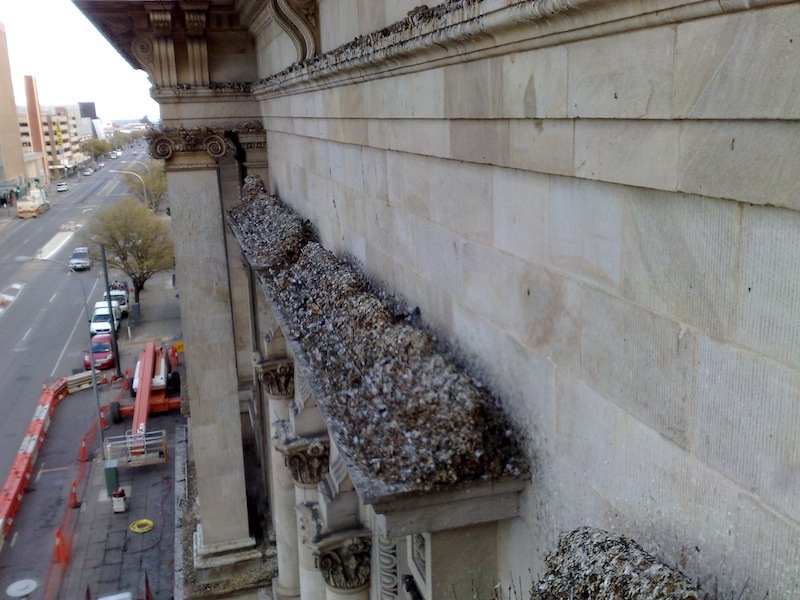 The operation would also involve removing from the building extensive amounts of bulk waste, as well as the existing pigeon-deterrent measures (which obviously hadn’t worked). 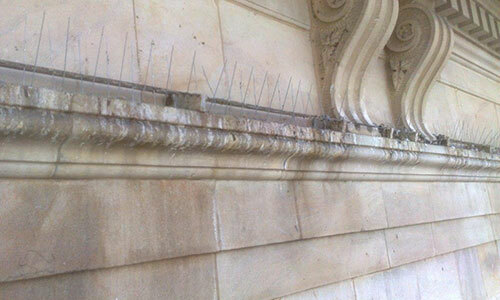 Finally, the entire 164 lineal meters of frontage, in some places up to 30 metres high, would have to be high-pressure cleaned, before new pigeon-deterrent measures could be installed. The success of this operation relied on thorough and careful planning, following our well-established project management processes. From the start, we needed to liaise closely with our major client, as well as other identified parties of interest. 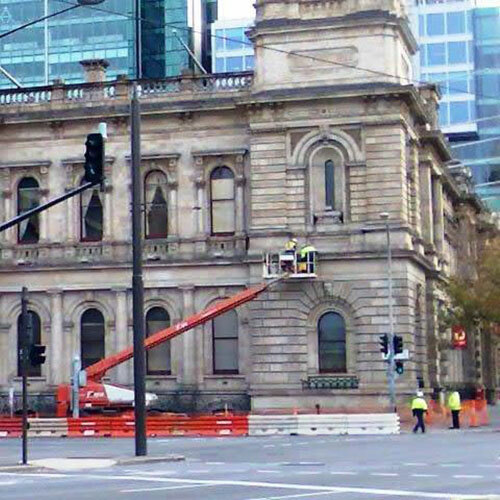 The Adelaide City Council needed to be approached for permits and traffic management assistance, the State Heritage Branch was required to be consulted for approval of the proposed activities, and naturally the tenants of the building owner had to be kept informed of proceedings. Emergency Property Solutions was able to develop and implement a successful operations plan to achieve all these outcomes. To complete this project we undertook the work over two weekends, including a public holiday, giving us five days to complete the task. We had three elevated work platforms on the site, each with a 30m reach. Our workforce consisted of ten technicians, who blasted the years of grime and waste build-up away with their high-pressure cleaners. All of the dirty wash-down water was collected and stored in recovery units, before being removed by tankers. In addition to this, the process required the use of numerous support vehicles, plus a full traffic-management plan, incorporating pedestrian races, signage and extensive bunting. By project’s end, we had removed 4,500 litres of waste water, over 2.5 tons of dry pigeon manure, and had applied 1,400 lineal metres of bird spikes on the building’s surfaces. The pigeon’s weren’t happy, but our client was. While undertaking the sign-off inspection, they even commented that the building now looked level, as the years of waste build-up had previously affected the lines of the facade, making it look tilted!